The 2015 RAM 1500 EcoDiesel might not be the newest truck on the market, but the fact that it was voted the Autobytel Truck of the Year for 2015 says a lot about just how amazing this pickup truly is. With its gobs of torque, excellent fuel mileage, and uncompromised capability when it comes to towing and hauling, the Ram 1500 EcoDiesel demonstrates just how much pent-up demand there was for a turbodiesel engine in a light truck. It also happens to offer one of the nicest passenger compartments available, and features a suspension system that has yet to be matched by its rivals. Let’s take a look at 10 reasons why the 2015 Ram 1500 EcoDiesel is the 2015 Autobytel Truck of the Year. The 2015 Ram 1500 EcoDiesel features a 3.0-liter, turbodiesel V-6 that offers up more torque than several of its eight-cylinder rivals. In addition to its 240 horsepower, the Ram 1500 EcoDiesel produces 420 lb-ft of twist, which makes for serious acceleration when already moving at highway speeds. In our opinion, that more than compensates for its less-than-V-8 performance off of the line, which is really the only area where the truck’s turbodiesel engine doesn’t feel as virile as some of its competitors. Unlike other special pickup truck drivetrains, the 2015 Ram 1500 EcoDiesel makes its turbodiesel goodness available across almost the entire product line-up. That means if you are looking for a basic single cab, Tradesmen entry-level trim with the EcoDiesel engine or if you prefer a fully decked-out Ram 1500 Laramie Limited EcoDiesel, you are in luck – the engine is available in single, quad, and crew cab body styles along with the Tradesman, SLT, Lone Star, Big Horn, Outdoorsman, Laramie, Laramie Longhorn, and Laramie Limited editions of the pickup. The 2015 Ram 1500 EcoDiesel’s excellent torque is one of its primary selling points, but that’s not the only bonus that comes with the pickup’s turbodiesel V-6. The Ram 1500 EcoDiesel’s mighty engine also happens to be quite frugal, to the tune of 20-mpg in stop and go driving and 28-mpg on the highway. That latter figure is phenomenal for a full-size truck, and it’s between three and eight miles per gallon better than other trucks from Ford, Chevrolet, and GMC outfitted with comparably powerful engines. Ram claims a 728 mile range on a single tank of fuel at highway speeds in the 1500 EcoDiesel. A big part of what helps the 2015 Ram 1500 EcoDiesel walk the line between fuel-sipper and full-on workhorse is its eight-speed automatic transmission. With two more forward gears than any other autobox available with a full-size pickup (shifted via a rotary dial that frees up significant space on the truck’s center console), the Ram 1500 EcoDiesel is capable of selecting the precise ratio required for hauling, accelerating, or conserving fuel while cruising at a steady rate of speed. The transmission itself is sourced from ZF, and is used in a number of applications across the Ram, Chrysler, and Dodge line-up with equally-impressive results. Let’s say you want to take advantage of the 2015 Ram 1500 EcoDiesel’s impressive single-tank range to explore areas where roads might be few and far between. No problem: the Ram 1500 EcoDiesel’s available four-wheel drive system offers a low-range transfer case that is designed to make short work of mud, rocks, and even streams. The EcoDiesel can also be equipped with off-road-ready gear such as skid plates, tow hooks, and a proper trail-going suspension system when you’re ready to get serious about the path less traveled. 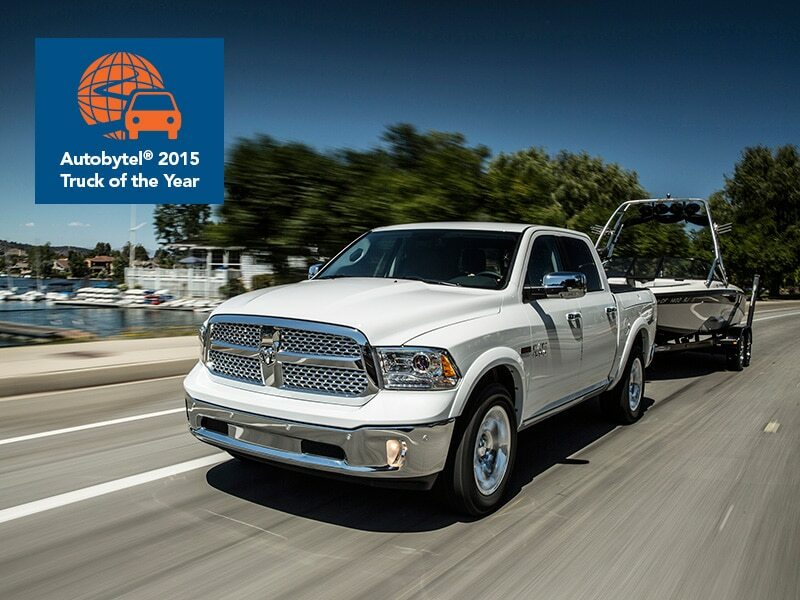 With so much torque on tap, you would be right to think that the 2015 Ram 1500 EcoDiesel is a towing champion. In fact, when properly configured the Ram 1500 EcoDiesel can pull up to 9,200 lbs of trailer weight, which puts it near the top of the light-duty pickup truck class. There’s also more than 1,500 lbs of cargo hauling capability waiting to be unlocked in the EcoDiesel, which is available with a variety of bed lengths ranging up to eight feet. Unlike any other full-size truck currently available, the 2015 Ram 1500 EcoDiesel forgoes a traditional rear leaf spring setup and instead swaps in a pair of coil springs to create a coils-at-each-corner suspension system. The end result is handling and comfort that are a cut above the Ford F-150, Chevrolet Silverado, and GMC Sierra, especially when driving over rough pavement (or no pavement at all). The best part? The coil system doesn’t sacrifice any of the Ram 1500 EcoDiesel’s practicality, and it can be aided and abetted by an optional self-leveling air suspension system. It may have the largest overall cabin, but it’s hard to deny that the 2015 Ram 1500 EcoDiesel’s top trim levels – the Laramie Longhorn and Laramie Limited – set the standard for interior comfort, fit, and finish in the full-size pickup segment. With reams of leather on the seats, door panels, and trim, combined with the class-best Uconnect touchscreen infotainment system and significant interior storage compartments (including an ultra-deep center console), the Ram 1500 EcoDiesel can be equipped to the point where it’s probably nicer inside than your first apartment. Complementing its exceptional interior style is sheet metal that continues to set the template for modern pickup design. The culmination of the ‘big rig’ look that Dodge first unveiled in the 1990s, the 2015 Ram 1500 EcoDiesel offers the over-sized crosshair front grille, muscular flanks, and huge hood that together come across as both classy and aggressive from almost every angle. Some might find the EcoDiesel’s extroverted personality a little overwhelming, but we feel that’s simply part of the truck’s charm. How much do you have to pay for the privilege of plunking an EcoDiesel engine under the hood of a brand new 2015 Ram 1500? Not as much as you’d think. Swapping out the base 3.6-liter V-6 (which generates 269 lb-ft of torque) from the entry-level Ram 1500 Tradesman in favor of the 3.0-liter turbodiesel’s 420 lb-ft of twist will set you back an extra $4,000 – or roughly $2,850 more than opting for the almost-as-robust, but not-quite-as-efficient 5.7-liter Hemi V-8. At the upper limits of the Ram 1500 universe, the cost to upgrade to the EcoDiesel drivetrain drops to $3,120. Either way, we feel that the turbodiesel’s benefits are well worth the price of admission. The 2015 Chrysler 200 has made the midsize sedan market a much more interesting place. Sales leaders like the Toyota Camry, Honda Accord, Ford Fusion and Nissan Altima have a real rival in this handsome new Chrysler. A wide range of options and a quality cabin are just some of the reasons Chrysler is back on the midsize map. Chrysler is suddenly a contender in the hugely competitive midsize sedan segment, a market dominated by the likes of the Honda Accord, Toyota Camry, Hyundai Sonata and Nissan Altima, to name a few. The 2015 Chrysler 200 sedan isn’t perfect, but it’s a quantum leap forward in terms of style, refinement, and available features compared to the previous 200. In fact, the new base version of the 200 is even slightly cheaper than the outgoing model (by all of $95 bucks). Starting at $22,695, including destination charge, the Chrysler 200 is powered by a 2.4-liter 4-cylinder engine that delivers 184-horsepower and 173 lb.-ft. of torque to the front wheels.This powertrain delivers a highway fuel economy average of 36 mpg. For buyers who want more power, there’s an optional 3.6-liter V-6 that delivers 295-horsepower and 262 lb.-ft. of torque. An all-wheel-drive system is also available, but only with the punchier V-6 motor. A 200 with the V-6 and front-wheel-drive returns 32 mpg, while the same engine mated to all-wheel-drive dips to a 29 mpg highway average. All models include a 9-speed automatic transmission, which is controlled by a rotary knob on the lower half of the center console. Staying on the subject of interiors, the cabin of the new 200 happens to be one of this sedan’s best features. The heavier you go with the options, the more bells and whistles (not to mention real wood trim and “bronze chrome” interior accents) get scattered around the interior. Yet even in base format, minus any fancy ventilated front seats or heated steering wheels, the Chrysler 200 cabin has a very attractive and robust look and feel to it. The console is especially useful, with loads of cubby holes and storage space. At 5 feet 9 inches tall, I found the rear seat to be comfortable, though some rivals definitely offer more rear legroom. The trunk is not very deep, but offers 16 cu. ft. of space and a 60/40 folding rear seatback. My first test car was a 200S AWD model, with the V-6 engine and all-wheel-drive hardware. With extras like 19-inch alloy wheels, navigation, rear back-up camera, upmarket sound system, remote start, and LED daytime running headlamps and fog lamps, amongst other options, the sticker price was $33,460. The 200 really held its own over some surprisingly twisty and demanding roads outside Louisville, Kentucky, where Chrysler staged the driving event. Uncooperative weather didn’t help, though soggy roads didn’t rattle the composure of the suspension. The steering was accurate but, like many vehicles in this segment, it isn’t overly communicative – I’ll get back to this point later. In terms of overall comfort and refinement, however, this Chrysler really shines. Now if only the 9-speed transmission lived up to its on-paper promise. A 6-speed automatic is normal in this segment, so I had high hopes for this gearbox. For the most part, it’s fine, and its operation fades into the background. Yet when it gets confused, the transmission shifts abruptly or holds onto a gear way too long. I played with the steering wheel-mounted paddle-shifters, only to discover that ninth gear is virtually useless – power is non-existent, even the punchier V-6 engine is happier one or two gears lower. For the afternoon drive, I switched to fully-loaded and 4-cylinder-powered 200C. There’s no getting around the fact the 184-hp inline-4 doesn’t have anywhere near the grunt of the V-6. Then again, without the added weight of the larger engine, along with the all-wheel-drive system, this front-wheel-drive 200 immediately felt lighter on its feet. Chrysler expects up to 40-percent of 200 sedan buyers to opt for the Limited trim level, which starts at $24,250. The steering had a little more verve to it, and with less power on tap, the transmission didn’t hunt as much for the perfect gear. Stuffed full of features, the 200C FWD model was priced at $31,460. That’s only $2-grand less than a V-6 and AWD version I’d driven in the morning. This car included a laundry-list of options, however, including the larger alloys, upgraded seating, LED lighting, and 8.4-inch touchscreen with navigation found in the V-6 model. The Premium Group ($995) interior trim, featuring wood trim and bronze chrome accents, is quite classy too. Electronic stability control and eight airbags are standard across the 200 lineup. Yet it’s the SafetyTec Package that stands out as an exceptional value. Only available on the 200C trim level (which starts at $26,990), this includes adaptive cruise control, brake assist for emergency braking, blind spot and cross path detection, front collision warning, lane departure warning and lane keep assist, rain sensing wipers, along with parallel park and perpendicular park assist. That is an absolute hoard of safety content, all for an incredibly reasonable $1,295 – and the extra outlay needed for the 200C model, of course. You don’t need to add more than $10,000 to the base price to enjoy the Chrysler 200. Pick and choose your options carefully, and you’ll still walk away with one very good midsize sedan. It doesn’t rewrite the rulebook, but the Chrysler 200 thrusts the American automaker right back into the thick of the midsize sedan segment – and far higher towards the top-of-the-class than anyone, myself included, had expected. Dodge’s Charger SRT Hellcat is a hot-rodder’s dream: with 707 horses under the hood, it goes 204 miles per hour and devours the quarter-mile in about 11 seconds. Chrysler bills the Hellcat as the fastest production sedan on earth, and this isn’t simply about bragging rights. Dodge, derided not so long ago for selling mostly bland family haulers, is rebooting itself as a muscle-car brand that appeals to guys in their 20s and 30s. When Fiat took control of Chrysler in 2009, Dodge wasn’t admired for much except its rugged and reliable Ram trucks. Marchionne split Ram off into its own brand. That left a desultory lineup that included the Avenger, a re-badged Chrysler 200 family sedan, and the Grand Caravan, a downmarket version of Chrysler’s Town & Country minivan. Dodges were priced to sell, often to rental-car companies and drivers with weak credit. Before imbuing Dodge with a muscle-car vibe, Marchionne needed to re-imagine the Charger and Challenger, cars originally created in the 1960s to take on General Motors Co.’s (GM) Chevrolet Camaro and Ford Motor Co.’s (F) Mustang. This year, redesigned versions appeared with more power, cockpit technology and styling that still echoes the original cars. Even the Durango sport utility got a performance upgrade, with an eight-speed transmission and the most horsepower of any mid-size SUV. The Charger Hellcat is a classic halo car. At $64,000 and change (compared with about $28,000 for the base model), it’s not expected to sell in large numbers. Rather it’s an aspirational tire-shredder intended to telegraph Dodge’s new street cred. The designers had a sense of humor, too. The car comes with two keys: A red one provides access the engine’s full horsepower; a black one limits the output to 500 horses — a dumbing-down for teenage sons or parking attendants. The modern muscle car isn’t the gas guzzler it was a half-century ago. The V-8 Mustang GT Fastback gets 25 mg on the highway, while the V-8 Camaro gets 19 mpg. Even the Charger Hellcat turns in a respectable 22 mpg. Focusing on performance may work well for Dodge, but it’s risky, said Michelle Krebs, senior analyst at Autotrader.com. “If prices go up or the economy tanks, discretionary purchases like performance cars are the first to go,” she said. So far Marchionne’s bet is paying off. The new Charger, Challenger and Durango have outsold their segment. Dodge says its cars now appeal to the youngest drivers in the industry, with half of customers belonging to Generations X and Y. The early successes give Marchionne what he needs to take the next step: narrow Dodge’s focus by ditching some models and gradually adding ones that fit the new direction. Dodge has stopped making the Avenger and will discontinue the Grand Caravan in 2016 when Marchionne also plans to give the mid-size Journey SUV and compact Dart their own performance makeovers. The company says Dodge will sell 600,000 vehicles by 2018. That’s only a slight increase from last year, but Marchionne will have to get there without the Avenger and Grand Caravan, which generated almost 37 percent of Dodge’s sales in 2013. That will require generating brand heat. To do that, Fiat Chrysler has resurrected John and Horace Dodge, who in 1914 started the company that bears their name. A print and television ad campaign depicts the brothers as fun-loving hot rodders who would feel at home in a Hellcat.